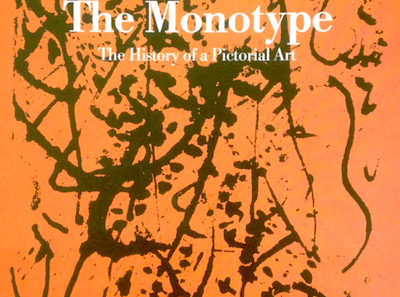 Carla Esposito Hayter's book The Monotype: The History Of A Pictorial Art describes "the birth and evolution of the monotype and... the historical and artistic circumstances that led artists to adopt this medium for four centuries." The book was first published in Italian, as Il Monotipo. Monotypes are "a technique midway between printing and painting", and indeed the first historical survey of monotypes was titled The Painterly Print (1980). Fritz Eichenberg's excellent The Art Of The Print (1976) also includes a chapter on monotypes. The Monotype and The Painterly Print both examine the origins of the monotype in the 1640s, and its revival in the 1870s. As Hayter explains: "The birth of the monotype is generally dated from the time of... Benedetto Castiglione". Castiglione's experiments with the technique began in 1640, and he had perfected it by 1645. The modern appreciation of the monotype dates from its adoption by Edgar Degas in 1874: "Degas produced... a corpus of extraordinary scale that is still unmatched for its importance and influence right up to the present. It was in fact Degas that inaugurated the modern use of the monotype". The Painterly Print remains the most significant and influential study of monotypes, though The Monotype is also important for its more extensive treatment of the post-war and contemporary era. An obvious example is the Abstract Expressionist monotype (1946) by Jackson Pollock on its cover, though there is also coverage of the monotype's "extraordinarily accelerated development over the last thirty years".